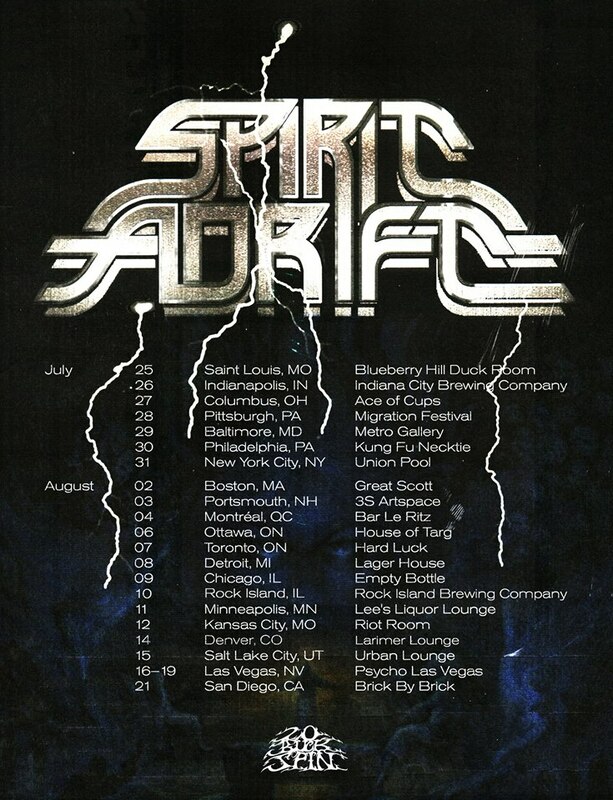 In early 2016, Spirit Adrift emerged, seemingly out of nowhere, with Prosthetic Records releasing the two-song debut EP Behind – Beyond and the promise of a full-length to follow soon thereafter. Those two songs are 12 and 15 minutes long, and often resemble the sludgy funereal doom of Minnesota’s Livid (including the emotive wailing vocals, although these are quite versatile and often slip into a growl or roar as the mood of the song dictates), combined with hints of the arid progressive-post-metal of Arizona’s North. As it turns out, that second comparison is interesting, because Spirit Adrift turns out to be the brainchild of Nate Garrett, guitarist of various other Arizona bands (including Gatecreeper and Take Over And Destroy). You wouldn’t know it by listening to that first EP or Chained to Oblivion (the album that came out just a few months later, as promised), especially with the lovely vocal harmonies and powerful guitar harmonies throughout that three-quarter-hour record, but all of the vocals and instruments on both of these releases — as well as writing of all the complex arrangements — are done by Garrett alone. More or less through-composed, these songs use the typical minor-key tonality of traditional doom metal, but often filtered with a bright and shiny lens: uplifting without ever seeming cheerful, if that makes sense. Think early Pallbearer or recent Yob. As single-member musical entities often do, Spirit Adrift found it necessary to recruit some extra folks when it came time to hit the road. For this purpose, Garrett added some Gatecreeper band mates as well as friends from other local bands such as Goya. And apparently at some point this live partnership must have generated some chemistry, because when it came time to record the sophomore album the following year (2017’s Curse of Conception, put out by 20 Buck Spin), this was done collectively as a foursome. The primary differences one might notice on this album from its predecessor are that there are slightly different — although still wholly complementary and harmonized — guitar parts present, and the bass sound is much more prominent here. The tone overall might seem a bit darker, certainly a bit heavier and more aggressive, but the arrangements and compositions remain as intricate and interesting as before, the guitar solos as stunning, the mood as somber; despite quadrupling the number of cooks, there is absolutely no worry here about the broth being spoiled. Get your very own copy of Behind – Beyond here; Chained to Oblivion here; and Curse of Conception here. All are available in MP3, CD, and vinyl formats. This entry was posted in Reviews, Shows and tagged 20 Buck Spin, Arizona, Gatecreeper, Goya, Livid, Meat Mead Metal, Migration Fest, Nate Garrett, Phoenix, Prosthetic Records, Psycho Las Vegas, Spirit Adrift, Take Over And Destroy, USA. Bookmark the permalink.